Bacopa monnieri (Coastal Waterhyssop, Brahmi, Thyme-leafed gratiola, Water hyssop) is a perennial, creeping herb whose habitat includes wetlands and muddy shores. 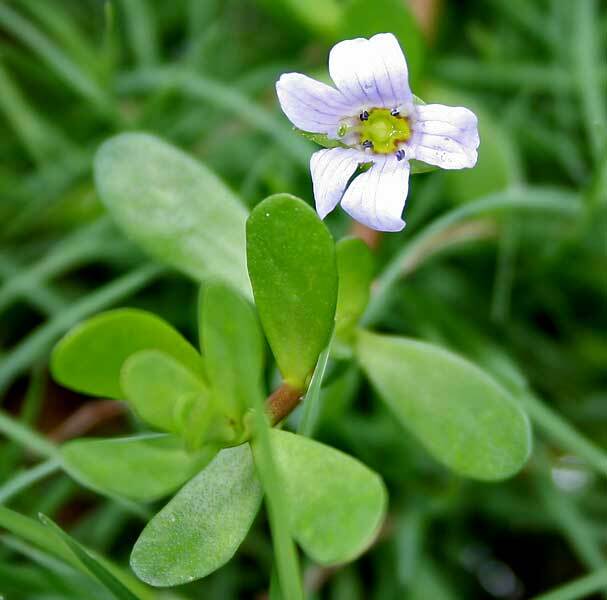 Brahmi is also the name given to Centella asiatica, particularly in north India, although that may be a case of mistaken identification that was introduced during the 16th century. The leaves of this plant are succulent and relatively thick. Leaves are oblanceolate and are arranged oppositely on the stem. The flowers are small and white, with four or five petals. Its ability to grow in water makes it a popular aquarium plant. It can even grow in slightly brackish conditions. Propagation is often achieved through cuttings. It commonly grows in marshy areas throughout India, Nepal, Sri Lanka, China, Taiwan, and Vietnam, and is also found in Florida, Hawaii and other southern states of the USA where it can be grown in damp conditions by the pond or bog garden. This plant has a number of uses in Ayurveda. It is a traditional treatment for epilepsy and asthma. It has antioxidant properties, reducing oxidation of fats in the bloodstream. However, anti-epilepsy properties seem to be in very high toxic and near lethal doses, so it's only used—at much lower non-toxic dosage—as an additive to regular epilepsy medication. Studies in humans show that an extract of the plant has antianxiety effects. It is listed as a nootropic, a drug that enhances cognitive ability. In India, this plant has also been used traditionally to consecrate newborn babies in the belief that it will open the gateway of intelligence. Laboratory studies on rats indicate that extracts of the plant improve memory capacity and motor learning ability. Recent studies suggest bacopa may improve intellectual activity. The sulfhydryl and polyphenol components of Bacopa monniera extract have also been shown to impact the oxidative stress cascade by scavenging reactive oxygen species, inhibiting lipoxygenase activity and reducing divalent metals. This mechanism of action may explain the effect of Bacopa monniera extract in reducing beta amyloid deposits in mice with Alzheimer's disease. B. monnieri has a demonstrated ability to reverse diazepam-induced amnesia in the Morris water maze test. The mechanism of this action is unknown. In some trials, bacopacide extract did not restore or enhance memory formation, but improved retention. In others including a randomized clinical trial of 98 healthy older people (over 55 years)Bacopa significantly improved memory acquisition and retention. Its many active compounds include: alkaloids (brahmine and herpestine), saponins (d-mannitol and hersaponin, acid A, and monnierin), flavonoids (luteolin and apigenin). Also in significant amounts: betulic acid, stigmastarol, beta-sitosterol, bacopasaponins (bacosides A, bacosides B, bacopaside II, bacopaside I, bacopaside X, bacopasaponin C, bacopaside N2 and the minor components were bacopasaponin F, bacopasaponin E, bacopaside N1, bacopaside III, bacopaside IV, and bacopaside V). In rats, bacosides A enhance antioxidant defenses, increasing superoxide dismutase (SOD), catalase (CAT) and glutathione peroxidase (GPX) activity. When a preparation of the plant was evaluated for safety and tolerability it showed no adverse effects but there were some reports of mild gastrointestinal symptoms. It is used in Vietnamese cuisine, where it is called rau đắng biển. It is used in cháo cá, a variety of rice congee made with fish and nấm tràm mushrooms. Bacopa monnieri is a known hyperaccumulator of cadmium, chromium, lead and mercury, and as such can be used for phytoremediation. 1. ^ "Bacopa monnieri information from NPGS/GRIN". www.ars-grin.gov. http://www.ars-grin.gov/cgi-bin/npgs/html/taxon.pl?102292. Retrieved 2008-03-13. 2. ^ "In north India, however, brāhmī is commonly identified as Centella asiatica (Linn.) Urban, which in Malayalam is known as muttil. It seems that this identification of brāhmī as C. asiatica has been in use for long in northern India, as Hēmādri's 'Commentary on Aṣṭāṅgahṛdayaṃ (Āyuṛvēdarasāyanaṃ) treats maṇḍūkapaṛṇī (C. asiatica) as a synonym of brahmi." Warrier, P K; V P K Nambiar, C Ramankutty, V.P.K. & Ramankutty, R Vasudevan Nair (1996). Indian Medicinal Plants: A Compendium of 500 Specie. Orient Blackswan. pp. 238. ISBN 9788125003014. http://books.google.com/?id=GkBRXzpqD98C&pg=PA238. 3. ^ Daniel, M. (2005). Medicinal plants: chemistry and properties. Science Publishers. pp. 225. ISBN 9781578083954. http://books.google.com/?id=5sU6yo1jFxQC&pg=PA225. 4. ^ Khare, C. P. (2003). Indian Herbal Remedies: Rational Western Therapy, Ayurvedic, and Other Traditional Usage, Botany. Springer. pp. 89. ISBN 9783540010265. http://books.google.com/?id=463ERB3VeUoC&pg=PA89. 5. ^ a b c d Rajani, M., et al. "Brahmi (Bacopa monnieri (L.) Pennell) - A Medhya Rasaayana Drug of Ayurveda" in Ramawat, K. G., Ed. (2004). Biotechnology of Medicinal Plants: Vitalizer and Therapeutic Enfield, New Hampshire: Science Publishers, Inc.
6. ^ Ghosal. S, Bhattacharya SK (1980). "Anxiolytic activity of a standardized extract of Bacopa monniera in an experimental study". Phytomedicine 5: 133–148. 8. ^ C. Stough, J. Lloyd, J. Clarke, L. Downey, C. Hutchison, T. Rodgers, P. Nathan (2001). "The chronic effects of an extract of Bacopa monniera (Brahmi) on cognitive function in healthy human subjects". Psychopharmacology (Berl) 156 (4): 481–4. doi:10.1007/s002130100815. PMID 11498727. 9. ^ S. Roodenrys, D. Booth, S. Bulzomi, A. Phipps, C. Micallef, J. Smoker (2002). "Chronic effects of Brahmi (Bacopa monnieri) on human memory". Neuropsychopharmacology (Wollongong) 27 (2): 279. doi:10.1016/S0893-133X(01)00419-5. PMID 12093601. 10. ^ Stough C, Downey LA, Lloyd J et al. (2008). "Examining the nootropic effects of a special extract of Bacopa Monniera on human cognitive functioning: 90 day double-blind placebo-controlled randomized trial." Phytother Res. 22:1629-1634. 11. ^ a b Dhanasekaran M, Tharakan B, Holcomb LA et al. (2007). "Neuroprotective mechanisms of ayurvedic antidementia botanical Bacopa monniera." Phytother Res. 21:965-969. 13. ^ Roodenrys, Steven Ph.D., et al. ; Booth, D; Bulzomi, S; Phipps, A; Micallef, C; Smoker, J (2002). "Chronic Effects of Brahmi (Bacopa monnieri) on Human Memory". Neuropsychopharmacology 27 (2): 279–281. doi:10.1016/S0893-133X(01)00419-5. PMID 12093601. 14. ^ Nathan, PJ, et al. ; Tanner, S; Lloyd, J; Harrison, B; Curran, L; Oliver, C; Stough, C (2004). "Effects of a combined extract of Ginkgo biloba and Bacopa monniera on cognitive function in healthy humans". Hum. Psychopharmacol. 19 (2): 91–96. doi:10.1002/hup.544. PMID 14994318. 15. ^ Morgan A, Stevens J "Does Bacopa monnieri improve memory performance in older persons? Results of a randomized, placebo-controlled, double-blind trial" Journal of Alternative & Complementary Medicine - New York 2010 Jul;16(7):753-9. 16. ^ Anbarsi, K., et al. (2006). Effect of bacoside A on brain antioxidant status in cigarette smoke exposed rats. Life Science 78:12. 17. ^ Pravina K, Ravindra KR, Goudar KS et al. (2007). Safety evaluation of BacoMind in healthy volunteers: a phase I study." Phytomedicine. 14:301-308. 18. ^ McCutcheon & Schnoor 2003, Phytoremediation. New Jersey, John Wiley & Sons, page 898.